found 25 med. today need to get some rain westfork ar. Picked 9 fairly huge in Trinity County outside of Junction City. 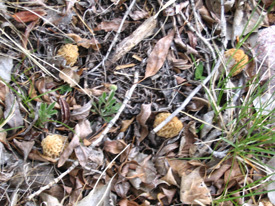 California Morel Report Found 35 yellow morels yesterday 5/10/07, 13 in one small patch. They are around the 4000' elevation in Amador County, California. On north facing slopes of logging areas. I have found 150 since May 1st. We have just found 10 yellow morels today. growing under cottonwoods northeast of Denver in Adams County. This was a nice surprise after having no luck finding any on our trip to Kentucky 2 weeks ago! Found another good, but smaller batch of fresh yellows on May 1st. Like the others found April 28th-30th, these were gathered under the big old cottonwoods (big leaf!) along the Arkansas River between Florence and Canon City. Come on rain and warm weather! Additional moisture has helped produce the biggest, heaviest morels Iâ€™ve ever seen in southern Colorado, with much thicker wall structure than Iâ€™ve seen here before. These most recent morels remind me of those I used to harvest in southern Wisconsin. Found 87 yesterday (May 5th) along the Arkansas that weighed-in at 3.5 lbs total. The yellows range in color from fairly dark brown thru light orange to some that are very light cream-white in color. Regardless of coloration, these are all quite thick-walled and very tasty! we found a morel growing in our yard in Winnebago Illinois. Winnebago is about 10 miles west of Rockford. It is barely out of the ground. We had a couple of very warm days this past week. It got up to about 70 on the day we found the morel. Seems awfully early, so it is probably just a fluke. I am so excited for morel season to begin! 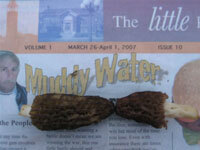 M. Kimes,I found 4 black/brown morels in the Iron Furnace area in Hardin County.Elizabethtown IL.03/20/07,About 2"long. Found 11 grays on 3-22 and 14 on 3-26 in Harrison, AR. Need some rain here! 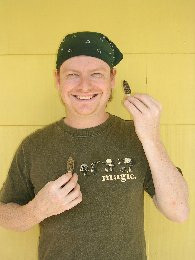 Jim H.
I found four morels; three black and one yellow in Union on March 26th!!! we found 4 greys and 2 big, rotten blacks. Jackson County, Illinois. Craig from Eureka here, On 3-30 I found about 15 coffee cup sized maroon colored morels and about the same number of small white ones in western Woodson co. Should be Great in a few days after it warms back up some! found 140 3/31/07 jersey county,il mostly greys and blacks smallesy 1/8 inch ,largest 2.6inches what fun it was!!!!! on march 31 found 140 greys and blacks, in the jersey county area. on april 4 the temperature outside was 28 found 84 greys, small but fresh, and fragrant.all in jersey county what fun it was.pk, 1999 women div. il champ still hunting see you in the woods!!!!!!!!!!!!!!!!!!!!!!!! Found 6 blacks, 2-6â€� in pope county all in 1 spot. Checked out where usually some early grays come up. Nothing. Found total of 267 lil Greys and some nice Yellows, in Macoupin County. This is my earley spot for years, more to come. 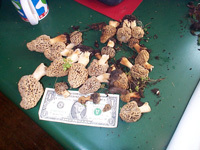 Mike H. found 8 morels on April 2nd; all smaller than a 1/2 inch. Found 7 Greys/Blacks in southern Tazewell Co., all 1/8" to 1/2", at April 3rd. this is the earlist I have ever found one by 7 days! The cold front will stop pops for a while but the point is THE HUNT IS ON!! Bill. near Carlinville illinois found about 300 little greys. Nice and fresh...4-5-07 Jim B. Picked these on 4/5/07 after work. 285 total mushrooms. Sizes from very small to 2". Needs to get warm. We have plenty of moisture, even though the wind is hurting that. Should be a good year though. Found my first morels today. 4-13. Friday the 13th started the season for me. Digging in the leaves I found 5 very small ones. Five days earlier than last year. Should be eating some in about 3 days, if my wife allows me to. I shouldn't have pulled them, but I was excited. Heres the pics. Broady, Lasalle county, Marseilles, Il. It's Les S. I found 19 grey and yellow shrooms Sunday the 15th in Madison county Illinois . Most 3 - 4 inches . 146 mushrooms 4/15 Grafton, Il. We took a jaunt in the woods near our home in Sangamon County, Illinois.....found one nice sized light gray. It was about 4 inches tall. Just a little too early yet. We had rain last week, but it was very cold. Has warmed up this week. We found about two dozen of these in Giant City park just south of carbondale, IL....rumor has it they dont grow there but we have found one spot where there is quite the abundance. Found a dozen or so small yellows yesterday in Madison County - they looked pretty fresh, so maybe the warm weather coming this weekend will pop more up! One week since I found the first tiny morels. Found 13 this a.m. Had to cover and leave them. Just barely poking out of the leaves. About an inch tall. Rain and sunshine would really help. Broady, Lasalle Co., Marseilles, IL. My son and I found 50 little grays last night in Quincy IL., Adams Co. It's Going to be a GREAT SEASON!!!!! Went out around today and found 4 little greys. My wife scored a double and and one each for the four year old and five year. Pretty small about an inch and a half but nice and fresh. Hopefully with these temps and a little rain the next couple of weeks should get the suckers popping. This is Tom. Vicky and I went in the woods around 5 p.m. today near Henry, IL. We found two small gray morels. Rain is predicted for Monday. A little moisture and not too hot of temperatures will mean the Roons will be up in quantities for the next three weekends. hey,scott w. here from depue il. bureau county.found 12 black morels on 4-21. all about 3 inches tall. same spot on the river bottoms every year! the greys will be next. Becky and Andy from Peoria County here. Found 55 mushrooms in Brimfield Sunday. We only had 1 1/2 hours to look. Small, but we've already found more than we found all year last year. Mix of a couple blacks, mostly grey and a few yellows. They were on the the land that we found them last year, but in different spots, none in our usual places. Found about 20 grey morels on Sat. 4/21/07. We haven't had any rain thus far during the mushroom season so if we do get a little the week of 4/23/07, we should have a great year! 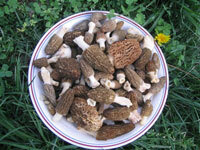 Charlie M.
hi tom brandon from marseilles have found 30 or so morels small greys after looking in all my best spots on sunday 21. its really dry already and been too cold at night . anyone from around here that calims to have found them any sooner is full of bs. it has been freezing at night here for the lsat week or more. with this rain coming wed and thurs u can bet ill have my bag full this weekend. Spent about 2 hours hunting in Knox County, IL this morning. Found about two dozen grays, all very small (some much smaller than a fingernail). Need some warm night temperatures. From St. Louis. I have just made my fourth trip into the woods in Illinois. I have found a total of about 27, a few more yellows than blacks. The yellows were stunted and dried out. This has turned out to be another terrible year. There hasn't been a good season here since about 1990. I won't be going again this year. Scott W. of DePUe Il. found 12 black morels. They were about 2 1/2 inches tall. They were found by the river bottoms. They grow there every year. They will all be out soon. The tide has turned for LaSalle County! Mr. Gray has been located. Got 16 fat greys about 2-1/2" tall. Rain helped a lot. Warm weekend coming. Yellows will be up next week in some of the early spots. Broady, Marseilles, IL. I found 4 grey mushrooms around Mahomet, IL. Finally! found 137 fresh 2''-3'' yellows in intermittent streambed. Grafton, Il. We went out last evening in Knox County near Williamsfield, and in 2 hours picked up about 100 nice Yellows all between 2 and 4 inch tall,and a few large Greys about 1- 2 inch, mixed in. The Greys were found isolated by them selves but the Yellows were in bunches of 3-4 and al on Southwest facing hillside. Going back out Sat ans Sun . With some warm Temps in the forecast, they should be poppin this weekend ! Good Luck out there! Ogle County has shrooms! 100 found on a southern slope. All grays, various sizes. Let the picking begin!! Couldnâ€™t resist piling them up and taking a picture! found about 200 more nice Yellows Sat and Sun 4/28 and 4/29 on Southwest facing hillsides in partial shaded areas. All were between 2 and 4 inches tall. Becky and Andy again, Found another 53 mushrooms in Peoria County (Brimfield)today (Sunday). They were much bigger this week. Lots of yellows this time and greys. Growing in weird spots again. Can't wait for the competition next week! We found 276 today near Rockford Illinois. We found a combination of yellow and grey morels. They were all sizes too. The largest was about 6 inches. We found the majority of them under two trees with lots of briars. It started to thunderstorm as we left the woods, so we are hoping more will be popping! Found Half A Dozen Yellows Ten Miles East Of Peoria Today. 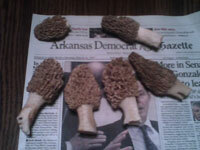 My husband and found about 30 NICE morels this morning in Macon Mo. They will be nice this evening. 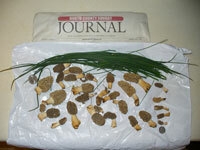 Fund 50 morels Sunday mixture of Grays and yellow in Mercer Co. IL. Next weekend should be good. Found a dozen greys in the back yard. Weather seems to be perfect for many more to come. Tuna in Dekalb county. found 5 today, we had better luck in central ILL found a pound and a half there. Hope to have better luck this weekend. Was out yesterday (5-2) for 2 hours, found over 200 blacks, let them go and picked 102 grays and yellows. Went out again tonight(5-3), found another 90..mostly yellows in the same spot. All between 2-4 inchesâ€¦the yellows are popping! All were found on a south slope amongst dead and rotting trees, and a lot of thorns. â€“Youch! Cook County ,Illinois-Go Get Emâ€™!! Found 3 today but this big boy was over 9 in long and should count for more than one. Little dry sunday, need some rain. central il. Found one on 5-12-07. Near Washington Illinois. Finally! Eleven small yellows. Side hill, southern exposure, full sun. Under Poplar. Saw first Dyrads today. Elevation 500'. Near Utica. found about 30 blacks lat. N 39.35 around cottonwood trees. Alice's good friend Paula found 3 blacks 1"-2" tall near Kimmell, IN on April 23. Paula had roons for supper, 4 blacks and 6 yellows on 4-29-07. Found, with no trespassing, near Kimmell, IN. This is Liell Grant Co. Indiana. I found about 200 morels, a combination of blacks and yellows. Found 2 yellows on May 2nd 2007 in the Fort Wayne area. This weekend should be pretty good hunting. My husband found some today April 3rd in Council Bluffs, Iowa. Looks like a good year!!!!! found in Wapello County Iowa on April 19,2007...walked 2 miles for this one...hopefully there will be more. Cheryl S.
Jeff from Des Moines here. Found a dozen mixed greys and tans south of Des Moines Tuesday morning. My son and I found about 20 greys on a southwest slope in extreme northeast Iowa. Should get good once it warms up this weekend. Hi from southeast Iowa, (Muscatine County). Just got in from the timber. We have had two days of cold rain. The sun has come out and it is supposed to be in the 80's all weekend. We found small grey ones, and a few small beefsteak. But the ground is wet and I bet it will be a great season. Unfortunately, I have to work all weekend! Found 10 small grey's in Benton County, Iowa. It will about another week before they really start popping through. Should be a good year, we have had a lot of moisture and will be warm this week. Happy Mushrooming to all! SPENT TWO DAYS IN SOUTH CENTRAL IOWA. WE FOUND EVERYTHING FROM FRESH GRAYS, TO TANS, TO YELLOWS. NUMBERS ARE REAL GOOD.WE TALKED TO SEVERAL SHROOMERS AND EVERYONE WAS HAVING EXCELLENT LUCK.NEXT WEEK LOOKS TO BE THE PRIME TIME IN SOUTHERN IOWA,WITH THE SCHROOMS MOVING TO NORTH IOWA. DAVE & JANE ROLAND IOWA. This afternoon, we found lots of little greys and yellows outside of Iowa City,IA. We should see big yellows starting this week. I found 40 greys and 1 yellow on Monday the 26th. All were fairly small and had not been up very long, maybe a day at most. I left about 20 still in the ground they were so small. SK. This is Roger "The Scotsman" from Pleasanton Kansas. Found 7 whites today East of Pleasanton, Kansas in Linn County. Size ranged from 1/2 - 1 1/2 inches tall. With a little rain it'll be a banner year!!! Tom mark here from kansas city mo went out fri march 30 found 140 little grays in one of my spots 1/2 inch to 1-1/2 inch found 3 in another spot about 2 inches tall looks about a week early here. good luck to all looks like we could have a very good year. Found 7 small â€œgraysâ€� in the Kansas City Metro Area this morning March 31, 2007. Only spent about 45 minutes looking, as they were very young / small, and needed a few more days to grow. Southeast Kansas. Found 150 small grays in Southeast Kansas. Everything was perfect - moisture, temp, etc. Going back again Sunday to look in another spot. If the rains keep up, and it doesn't freeze, this could be a banner year. Wolfie. Lucked into a new location in the KC metro today (4/1). I found 41 within about an hour on slopes going down towards the SE. I literally stepped into the woods and began to find them. All were fresh and between 2â€� to 4â€� high, growing near dying elms. More rain in the forecast for Tuesday night. Yeah! The undergrowth has already started, but the elms hadnâ€™t leafed out yet. Going to be a banner year! CS in O.P. Found 110 yellows and greys today April 1st in Marion County Kansas. Without fail, 10 days after the redbuds bloom. Nason J.
LeRoy & Rodney called at 6pm tonight picked 15 yellows & 42 grays & whites, oak city area. Hope everyone has a great season. Found 15 yellows in one spot. Eastern Kansas. Found 1 black morel today in Hart county KY. That is the earliest I have ever found a morel in KY. This spot usually starts to produce the 1st week of April. Finally got lucky in Maryland! Found about 60 total (balcks and grays) between the 22 and 23rd of April. North East corner of Maryland, same spot every year:) Happy Hunting Everyone! Since April 30th, I have seen small grays and blondes in many areas. On May 1st, a buddy and I picked nearly 200 blondes in Oakland county, Michigan. Today, May 3rd, I was out for about an hour and found about 2 dozen 2-4" grays. I found 2 of the large stem, small capped, brown morels today near Battle Creek Michigan. Both appeared to have been up for 2 or 3 days. I have found no others so far. 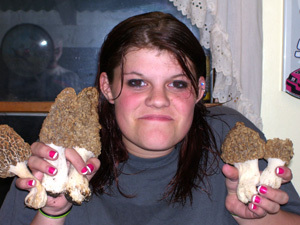 Hi, I live near Lâ€™Anse, MI in the Upper Peninsula and started seeing black morels 5/4/07. Best pick so far was 245 on 5/10! 34 small grays, in about 1/2 hour. Just before dark on May 8th. YUMmmmmmm, but need some rain. Went to one of the shrooming spots and was horrified when I saw the forest service mowing the grass where I pick. Found a few reminents of mushrooms around the mower. Found about 30 in Alcona county over the weekend. Mostly 2-3 inch whites, and a few large yellow's about 5 inces in size. Also found a run of about 10 picture perfect blacks. I forgot to put something in the picture to compare the size of the shrooms to but, the blacks in the top row are about 3.5 inches tall. Went back home and found another 30 yellows and whites in the back yard. The attached picture shows the ones found north of home. Happy hunting everyone! found a few blk pretty small mushrooms in southern minnesota. Need rain really bad! Found 1 morel this afternoon in Blue Earth County. We need rain, and it will be on. DebB. While Turkey Hunting in Carroll County Mississippi, my son and I found a nice patch of Yellow Morels. This was on Wednesday March 28. 41 in all weighing in just under 2 lbs. Found 3 yellows in western Lafayette County, Missouri. No Foolin'. Found 15 yellow morels yesterday in New Madrid County, Mo. near Mississippi River. St. Clair/Henry Cty, Mo. Bro found 16 grays early morning April 1st. Blind Pappy, Bro, and I found about 20 later in the day. I found 9 under 1 oak tree. Bro went early afternoon and "caught" another dozen and 10 more white's on our lake road at Truman Lake. Pretty good day of hunting!! I found my first morels of the season on Sunday, April 1st. I live in the Missouri Ozarks in Douglas County. It was such a thrill to find that first one. I guess I found around 15-20 of the little treasures ( the yellow variety). I can't wait to get home today to hunt some more. We found these little morsels on 4.2.07. This is the earliest we have ever found a morel! Found them in central Missouri. Freezing temps are expected the next few nights, sure hope that doesn't have a negative impact on our mushroom season. Found 100+ yellows and grays 1/2" to 3", Jackson Co, MO in low-lying damp areas. Hi Tom, Found 20 'fresh as a missouri morning' yellow morels today(4/3) here in Boone County! Michael here in north central missouri and I had a fairly good weekend. Hunted the 27th - 28th and although I have had finer years as far as quantity the yellows and greys were of the finest quality I have seen in some time. I dont have an official count but I would say several hundred were found by 4 four of us. Most were around dead elms in shaded and moist areas with patches of moss and may apples present. Most people have their own indicators but the one that has brought me the most success is when the may apples have a bud and or are already blooming!!!! They are out there and I will find them all. Midwest Morel King and Queen signing off. 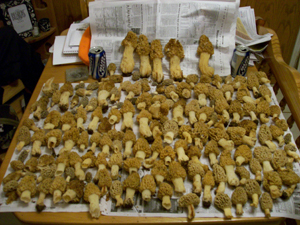 Found 408 morels or six pounds on 4/25 and 4/26 in the Troy MO area. they are out!!! !...2 good days of hunting on 4/25 and 4/26 ranging in color and size along the river some growing right out of standing water in spots, seems like the season is about a week behind last year figure to start in the hills next week. good luck R.J.
found 1st morel today in southern dutchess county 5-10' from dead elm, in underbrush. Found 9 very small, dry and widely disbursed morels around the watershed trail system near Lake Townsend, again, north of Greensboro. It's been dry since then so I don't expect to find more unless we get rain soon. Raleigh, NC Even better luck this weekend found 116, 90 with a couple of local guys John and Jason just off the falling slopes in and around the tulip trees and another 26 in one of my favorite spots only had about an hr. as not enough sun to see well. Will try another woods tomorrow hoping for another bigger mess. Me and Hip took our 83 year old mother up to the top of a mountain in Vinton county Ohio on march 30, and we found 18 of the early black morels.What's amazing is there are 160 acres of woods we hunt on,but the first mushrooms always come up in a spot no bigger than your living room.We found this spot by an old dead tree a few years ago, and it produces the first mushrooms every year ! 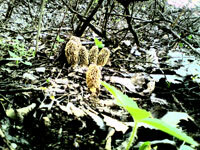 I found several black morels "somewhere in Clermont county" on April 2. After finding 18 blacks last week in Vinton county Ohio, the weather turned cold and snow fell almost every day. I talked Hip in to going on 4-7-07, even though there was snow on the ground. The wind chill was 16 when we left Pataskala that morning. He said it was the first time he had ever hunted mushrooms in the snow. By the time we got to Vinton county there was about an inch of snow on the ground.I thought " OH BOY"...but I knew some mushrooms had to of come up the 4 days after we found the 18,because the temps were around 75 before the cold front came through. I was right ! We found several blacks in the same spot as last week, but the amazing thing was Hip said " Let's follow the old fence line down the hill and see if we can find something on the way down". Half way down the hill Hip spotted a huge yellow morel. He wanted to take a picture of it with snow on it, and then spotted about 8 more.As our good huntin' buddy Larry M. put it......History was made !!! With a total of 30 shrooms , I guess it wasn't so cold after all....WOW !!!! scioto county,ohio. (the southern tip)ive found 10 black shrooms in two early trips,2 greys,1 half-free. 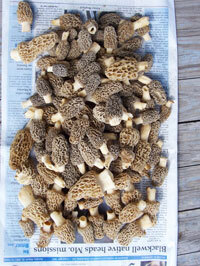 April 17 found several black morels,one gray and some white morel 25 in all.Found them in highland county outside of greenfield ohio. southern ohio,finally a decent day.wednesday i found 77 mostly grey shrooms,with a few whiteys.shawnee state forest friendship,ohio.good luck everyone. hello again.its on in southern ohio finally.went again today,found 81(mostly white)shrooms today.its about time.good luck to you all,and happy hunting!!!!!! Found a dozen grays in Ottawa County. It's getting ready to take off!! found 10 sm. greys 03/24/07 alongside railroad tracks. 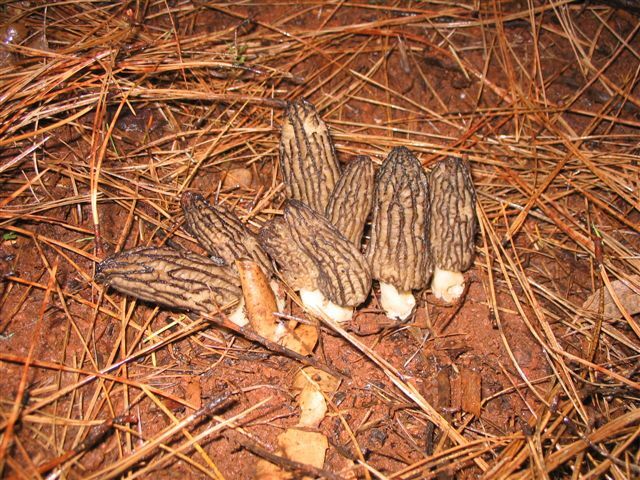 j king osage co. ok.
6 small morels central okla R.W. found 27 fresh morels in central tusa this evening, along abandoned railroad tracks, amongst scrubby trees, grass, wood debris, and rubbish. --d. martin; tulsa, ok.
BEEN A VERY COLD SPRING THIS YEAR.MOST YEARS I FIND THEM ON THE 7TH 8TH OR 9TH OF APRIL. MOST I FOUND WERE TO SMALL TO PICK .BUT I DID PICK 2 TO SHOW MY WIFE. Friend & I decided to look after the week old cold spell & found 5 blacks in lower Northumberland County this noontime. All were fresh & about two inch cap size. Located on a south facing slope on the edge of a hollow. Hello from Lebanon County, Pennsylvania! Today I found 53 lovely mushrooms! Most were gray...small...some nice sizers too. They're out! I'd love to hear from other Pennsylvanians. Happy Hunting to all!!! -Kathy M.
found a "gray" sponge in our early spot today, 3/23/07. I am 60 miles N.E. of Nashville, 5 miles from the Kentucky border. Need rain badly, We have the heat! Well what started out to be a great year turn out not to be had some cold weather this month went today after a rain and found 1 dried up . I have found close to 100 or so this year in Tennessee near KY line but they were found last of march first of April guess have to look forward to next year. Good hunting to those up north maybe you all can find a bunch. North Central Texas â€“ My sister and I found 54 morels in 2 hours! Mostly yellows and a few greys. Most were very fresh, but we had to leave 4 behind that were old beyond consumption. Our find exceeded our expectations considering our lack of rain! Last three years have been awfulâ€¦looks like we can look forward to a good one this year! I LIVE IN THE BLUE RIDGE MOUNTAINS OF VA. WE HAD GREAT WEATHER FROM MARCH 15TH TO APRIL 5TH IT SNOWED AND GOT VERY COLD AFTER THE WARM SPELL. 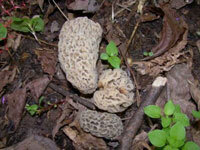 I HAVE FOUND 35 BLACK MORELS SINCE 4-2-O7 UNTIL 4.9.07. I WOULD ALSO LIKE TO KNOW IF BLACK MORELS WILL GROW IN AREAS THAT HAVE NOT BEEN BURNED. IT SEAMS LIKE I ONLY FIND THEM IN BURNED AREAS UP UNTIL 8 YEARS AFTER THE BURN. ALSO I HAVE BETTER SUCCESS WITH AREAS THAT HAVE ALLOT OF BRIARS INSTEAD OF WIDE OPEN WOODS UNDER POPULAR---WE HAVE NO ELMS. I ALSO FOUND 6 WHITE MORELS. THIS IS VERY EARLY FOR US. IT IS DRY AND WE NEED RAIN ---I THINK THIS IS GOING TO BE A GREAT YEAR IF WE GET WARMER WEATHER AND RAIN---I COLLECT ABOUT 18 DIFFERENT MUSHROOMS THROUGHOUT THE YEAR WITH ALLOT OF SUCCESS. Found seven morels in Vancouver Washington. They're Here!!! I found 5 Morels in my yard here in Washington state. They were growing in some gravel that I had spread last summer. Master J from Morelmasters here. I found a morel on Wednesday April 18th. To my surprise it was an inch tall. It must have been up for a few days. 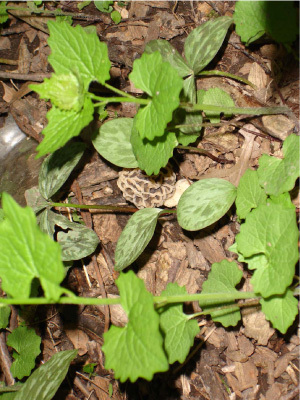 The morel was found on a steep open south facing slope. We will begin harvesting on south hillsides on the 27th of April. (unless of coarse it does not rain until then) Season will peak here in southwest Wisconsin around the 4th 5th or 6th of May. 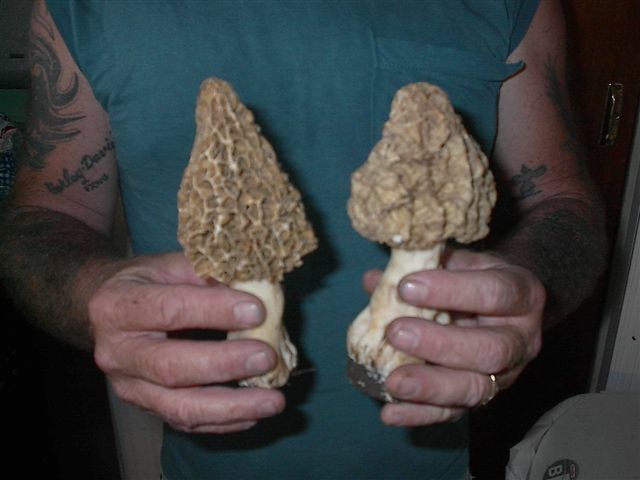 Good luck to everyone and thanks to Tom of Morel Mania for a great site! 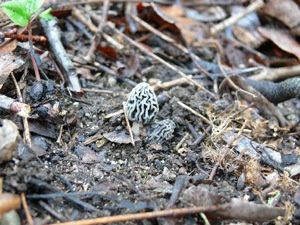 Found 1 inch morels 50 miles west of capitol city 4/20/07 James R.
I found 3 Morels 1-2" near Mount Horeb WI, on a southeast hill, with my son. Soggy kind of day, brightened by the first finds of the season, for us. Should be a another great year. Thanks you for hosting this site as a resource for all. Found two one inch tall on a south facing bluff in Rock County WI. April 25 Tim K.
I picked about 20 grays in Madison, WI, yesterday May 2nd. I'd much rather report morel sightings, but a nature hike along a lowland creek in the Sheridan area Sunday (April 29) produced 1-1/2 hours of non-sightings. Conditions seemed perfect (several 70-degree days, moist ground, decomposing fallen trees, etc. ), but no "treasure". . .perhaps the ground is a bit cool yet, or I need to range further from home. don't know if you guys are interested in international sightings, but I picked close to a pound of nice morels in central London (London, UK!) two days ago, i.e. Monday 16th April. Mushroom pie for dinner tonight, I think. Cheers! Ollie. Here in Ontari the season is a couple of weeks late in respect to 2006. 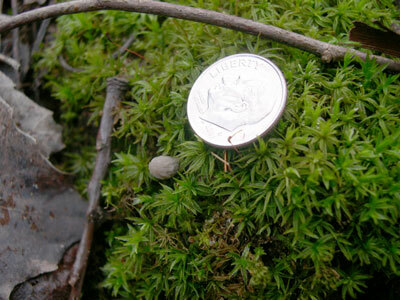 On may 7 Spotted a dozen Esculenta very small on the eastern shores of lake Ontario; the tallest was 1 inch. Rain is needed to get them really coming. Ontario hunter, U.P. Approximately 10miles north of Barry Ontario, I found 62 half-free morels. Last year weren't that good. This year is looks promising.